While any form of back pain should be assessed by a qualified medical practitioner, certain exercises can greatly reduce the pain. There are many exercises you can do to improve and prevent back injuries. I have listed those exercises right here. Acute pain is very common and generally lasts for about three to six months. It generally occurs in the lower part of the back and can be more severe in one side. Acute pain could also be directly related to tissue damage. Fast, immediate, intense pain could be termed acute, and is likely to occur immediately following some kind of back injury. For example, a torn muscle or strained join can result in acute pain. A chronic condition can develop from acute pain, if that pain occurs intermittently over a longer period (three to four periods of acute pain over a year could result in chronic pain). Described as deep, aching and dull, chronic pain often originates in the lower back and can radiate down the side of one leg. Chronic pain is the type that often makes it unbearable to work or go about any daily activities that involve standing of moving. Nerve damage, or arthritis, are often causes of chronic pain and, as such, the pain lasts for a longer period than would acute pain. The type of pain described as neuropathic is generally unrelated to any observable injury or condition. The nerves that govern pain transmission continue to send pain messages to the brain even though tissue damage has healed. Burning, cold, tingling, weakness, sharp and severe can be used to describe neuropathic pain. This should be ruled out before any firm diagnoses of acute or chronic pain is made as it will have different treatment options. 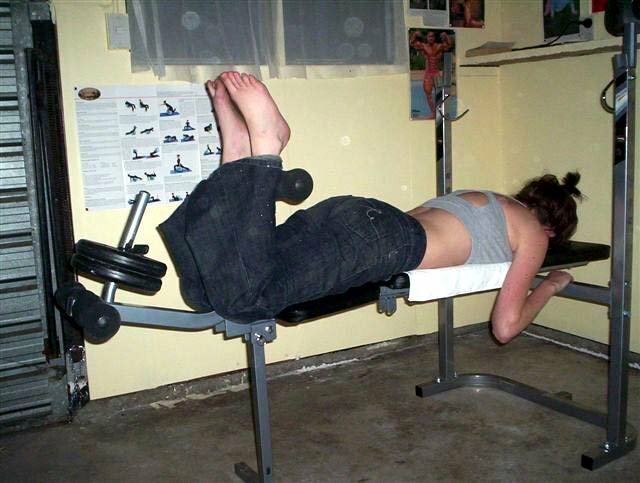 Exercise will generally not be prescribed for this type of pain. The types of exercises to control back pain, or prevent it from occurring in the first place, vary, depending on the specific stage one is at. One is advised to begin with a few basic exercises to address acute pain, and progress to a larger number of more advanced movements after pain has subsided, or due to the nature of the pain, use exercise selected for either the acute or chronic phases. Finally there are those exercises that can purely be used for prevention. The type of condition and corresponding exercise options are listed below. Acute lumbar pain is pain that is felt in the lower back, that may come from the muscles, nerves, or joints. This pain may also radiate from other areas such as the a groin hernia, or damage to another area of the back. Acute leg pain can result from lumbar back pain. As mentioned, a strain can last for a long period qualifying it as chronic pain. Tense muscle can often result in an acute from of back pain. With all exercises, stop if pain increases. Do not continue exercise! It is advised that exercises are attempted with the blessing of ones physician. For best results, perform relevant exercises, grouped into a session, three-times-per-week with one day off in between. These exercises can also be done at the end of a regular gym workout. This exercise gently stretches the muscles and ligaments of the back and helps one maintain a position where their back is stabilized and less prone to injury. It also strengthens the abdominal muscles that indirectly support the spine. 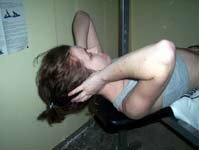 To perform, lie on back with arms at side. Then, tighten the abdominal muscles while squeezing the buttocks and trying to push the lower back into the floor, while tilting the pelvis into a neutral position, and keep it this way throughout movement. Hold for six seconds, and repeat up to ten times. This exercise helps to loosen up the back after sitting for extended periods and can help with acute lower back pain. Ease into the movement slowly, as it could be uncomfortable to perform at first. To perform, lie face down with hands flat on floor and level with the shoulders - in push-up position. Then, push-up with arms, while leaving the hips on the floor, Lift head and shoulders as high as possible, while letting back sag inwards. Hold for six seconds and repeat up to ten times. Side gliding will help to pull the hips into alignment, if the pelvis tends to tilt to one side in the standing position. To perform, stand with feet shoulder width apart, with knees straight and hands hanging loosely at the sides. Then, slowly, simultaneously, slide hips to the right and shoulders to the left. Return to standing position and relax, while keeping hips in this position - do not let them slip back. Repeat up to ten times, before switching to the opposite side. This is an excellent exercise for loosening up and mobilizing the whole spine, as the muscle around the side of the trunk and waist are stretched. To perform, stand with feet shoulder width apart and hands at sides with knees slightly bent. Then, slide the left hand down the side of the left leg and stretch right arm above the head. Hold for up to ten seconds and repeat up to ten times on each side. 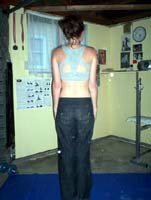 If one has a disc problem, this exercise should be avoided as it places quite a bit of pull on the intravertebral discs. This exercise really helps when muscle of the back are tight and aching. To perform, lie down in a pelvic tilt position. Then, draw knees up to the chest, while keeping the lower back flat. From here, grab the legs and squeeze the knees to chest. Hold squeeze for at least ten seconds, and release, and lower slowly. For best results perform this movement every couple of hours or so throughout the day. The aim is to gently arch the lower back which helps to maintain a natural curvature. To perform, stand straight with feet shoulder width apart, pointing directly forwards. Place hands on lower back region and bend backwards, breathing out slowly. Lower back must finish in an arched position, and be continually supported with the hands. Repeat up to ten times. A very good exercise for acute lower back pain, if performed correctly. To perform, begin on hands and knees, while rounding back like a cat. hold this position for five seconds. 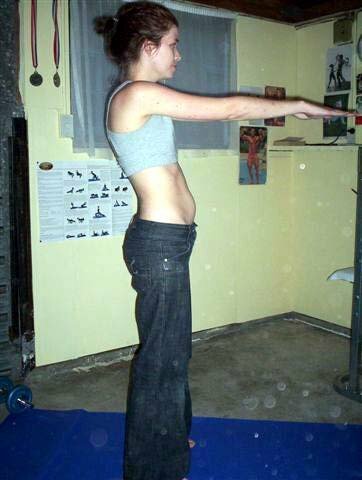 Then, gradually let back sag and hold for a further five seconds. Repast up to ten times, and perform often through the day (every two hours or so). This movement helps to improve general mobility and is effective in relaxing the back and pelvic regions. To perform, Lie on back with arms bent and feel flat on the floor, while pressing lower back to the floor. Then, keeping knees together, lift them until they are above the mid-waist area. Arms should be spread wide at this point. Finally, let legs flop to the right, as far a possible. Hold for a minute before repeating on left side. Repeat on both sides up to ten times. Abdominal movements are essential for overall back health and should be included in ones routine irrespective of any existing back problems. They will strengthen the area surrounding the pelvis and lower back, helping to provide ability and ward off injury. 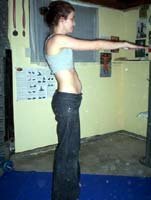 A very effective exercise for developing the abdominal area, and enhancing trunk rotation. Any turning movement will incorporate the muscles targeted in this movement. To perform, lie down with legs bent, and feet placed firmly on the floor, as in the pelvic tilt position. Then, raise left knee, while resting right hand on this knee. Push with arm, while resisting with the knee, and maintain the pressure for up to ten seconds. Repeat up to ten times before switching to right leg. This exercise is less intensive than a regular crunching movement, and benefits all back conditions. To perform, lie on back in pelvic tilt position. Then, raise head until chin touches chest, while reaching forward with hands towards the lower body. Hold this position, while keeping back flat on the floor, for up to five seconds. Relax, and slowly ease back to starting position. Repeat up to tem times. Used primarily as a prevention exercise, oblique crunches require existing flexibility and stamina, and adequate mobility. To perform correctly, these require sufficient coordination and ability, but are well worth the effort to learn. To perform, lie on back with arms outstretched and knees and hips bent. Then, while bringing hands to the sides of head, simultaneously bring opposite knee and elbow together. Complete at least 50 repetitions per minute, rotating trunk and coordinating breathing. Leg exercises will help to build strength and stability throughout the pelvic/lower back, and of course, leg region. This will help to ensure correct alignment of the spine and prevention of degenerative weakness and injury. Squats are deemed the king of all exercises, and for strengthening of the lower back and hips, they are unsurpassed. For preventative purposes, squats will help to build thickness into entire lower trunk region, thus providing structural support. Ideally squats will be performed with weights, which will be increased in line with improvements in strength. However, for the purposes of this article, squats will be done without any weight initially - weight will be added as one progresses. To perform, stand with feet shoulder width apart, and pelvis tucked in and hands placed on opposing shoulders. Then, bend at the knees and descend until buttocks are slightly below knee level. Push back to starting position. Maintain a straight spine through movement. Squats should pretty much take care of leg strength, if done correctly. However, leg extensions will help to add strength to the fontal thigh (quadriceps) from a different angle. Coupled with leg curls, they will help to add total development and add to leg stability. To perform, sit on bench, while placing feet under pads. Then, bring lower legs forward to achieve a full contraction. Lower slowly and repeat for at least 10 repetitions. Leg curls will strengthen the buttocks and back of leg (hamstrings), and are essential for balancing out leg development, which will help to ensure greater stability for the lower back. 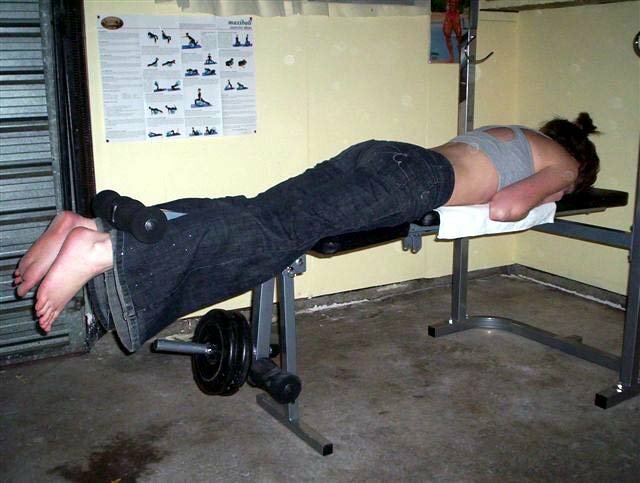 To perform, lie on leg curl bench and place heels under pads. 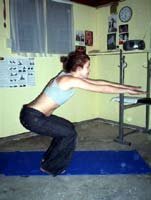 Curl legs to the buttocks, to achieve complete contraction. Slowly lower, and repeat for at least 10 repetitions. This exercise is useful during the acute phase of neck pain. It strengthens rear neck muscles, and provides helps to enhance correct alignment of the spine, and posture. To perform, lie on back on a soft surface, with shoulders resting on the edge. Head should be supported by the hands and positioned over the edge of surface. Then, lower head gently, while breathing out. Let the hands take the weight of the head as it falls back. Eventually lower the head all the way back to a full extension, and remove hands. Try holding for up to one minute. Progress to a longer period as neck becomes stronger. This exercise is used after severe neck injury as a way in which to strengthen it too offset any further potential problems. 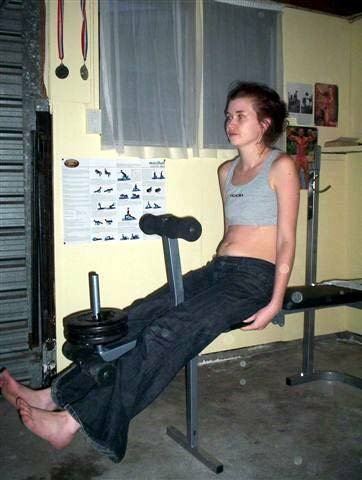 Retraction and lengthening is one of the best exercises for postural enhancement. If one has a tendency to droop their neck forward, this exercise will bring the neck back into correct alignment, over the long term. To perform, look straight ahead, pull chin back (this will lengthen the neck). Then, raise the shoulders and lower them slowly - keep neck straight and chin tucked in throughout. Always maintain steady, relaxed breathing throughout all movements. Back pain management is almost becoming essential in today&apos;s world of obesity, lowered physical activity and increasing injury stemming from sitting for long periods and the like. Back pain can, in fact, be one of the most debilitating experiences. Fortunately, there are a variety of effective ways in which to manage acute, and chronic, back pain, with exercise being one of the most easily accessible and proven methods. The exercises featured in this article are all effective in treating the specific problems highlighted. However, there are many more beneficial movements which enhance back strength, stability and postural alignment, and these will be the focus of a future article. As mentioned, it is advised that one contact their physician to get a second opinion on whether the advice in this article will benefit them. Tanner, J.(2003). Better Back. DK: London.